Update: It seems that the UNFCCC background page referred to below has changed and the link no longer works – see table of contents. A response from Justin Wood, writing to me from Australia after my previous post (cited with permission below), has prompted me to write a follow-up on the story of the greenhouse effect (GHE). It actually says that incoming solar energy is ‘reflected’ by the planet’s surface ‘in the form of a calmer, more slow-moving type of energy called infrared radiation. … Infrared radiation is carried slowly aloft by air currents, and its eventual escape into space is delayed by greenhouse gases’ (emphasis added). I won’t discuss the stratospheric cooling now, but rather try to place recent events (including floods in Niger), which involve the hydrological cycle and atmospheric circulation, into the framework from my previous post ‘A simple recipe for GHE‘. Again, it can be useful to stop and contemplate whether a simple conceptual framework can provide greater understanding of climate model predictions and the observations we make on the climate system. I think that there are not too many simple descriptions, as Wood pointed out, that are convincing in terms of physics. Can we use such simple conceptual explanations for events such as the recent spate of extreme rainfall and heat waves then? I want to stress, as we did when discussing tropical cyclones, that single events do not constitute evidence of a climate change. Since climate can be defined as ‘typical weather pattern’ (or weather statistics), then climate change can be that extremes become more or less typical, and such change must start with a few events. This touches the difference between weather and climate, and each of these events can be considered as weather. But there is a connection between these weather events and results obtained from climate models. There are fascinating as well as disconcerting sides to the fact that global climate models reported in the IPCC AR4 suggest warming in the upper troposphere in the tropics (Figure 1 below). I regard these traits as important clues that may help unveil the secrets of the troposphere; The key into this mystery involves energy conservation, planetary energy balance, and the planetary energy input taking place at its surface while its heat loss mainly occurs at higher levels, as discussed in ‘A simple recipe for GHE‘. This story is about surface fluxes, a fuzzy connection between energy flow and circulation of water, and physical constraints pin-pointing the solutions. In other words, the hydrological cycle associated with moisture transport is tied to the energy flow associated with moist convection. IPCC AR4 Figure 9.1: zonal mean atmospheric temperature change from 1890-1999 (deg C/100yrs). Panel (f) shows modelled response to all forcings. I will yet again try to present a simplified physical picture: Our climate includes energy transport both from the equatorial region to the poles as well as a vertical flow from the surface to the height from which it can escape freely into outer space. The story behind mid-to-upper tropospheric warming strongly involves the vertical energy flow, which will be the focus of the discussion. 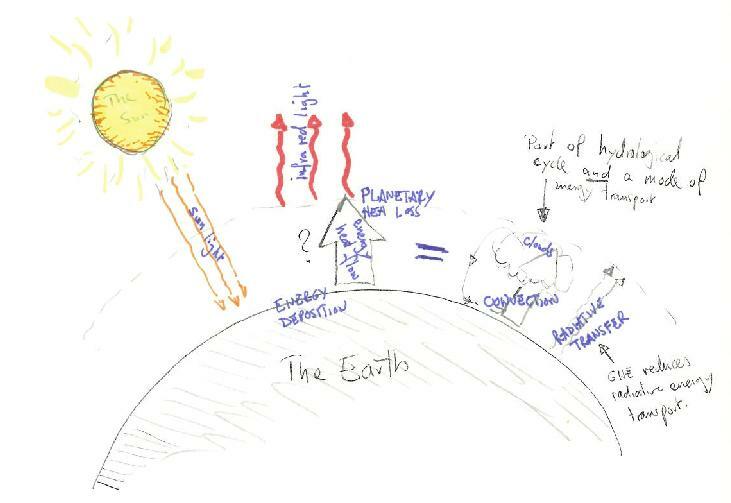 In very simple terms, the laws of physics say there has to be a flow of energy from the planet’s surface, where energy is deposited, to the heights from where the heat loss takes place (see schematic below). A schematic illustration showing the surface acting as an energy source while the energy sink is found higher aloft. The flow of energy between these two levels is key to understand the effect of the GHE on the hydrological cycle. The vertical energy flow can take several forms: radiative, latent, and sensible heat. The radiative energy transfer has a character of diffusion (photon diffusion), and the more opaque the atmosphere, due to increased GHG concentrations, the slower the effective radiative energy transfer. A similar situation is believed to take place in the outer layer of the Sun, in the opaque convective zone, where convection is the main mode of energy transfer (which by the way subsequently play a role in solar activity). If this were the whole story, then an increase in GHG concentrations would imply a deficit between the rate of energy gained at the surface and heat loss from the upper atmosphere due to hypothetically lowered energy transfer between the two levels: The emission temperature would decline as a result of net heat loss high up, and surface temperature would increase as a result of net gain in energy on the ground. One consequence of a deficit in the vertical energy flow would be different heating and cooling rates at different heights that subsequently would alter the atmosphere’s vertical structure (lapse rate). The planetary heat loss would drop if the emission temperature were to drop, and the planet would no longer be in energy balance, resulting in energy accumulation. However, planets will eventually reach new equilibrium states where the heat-loss balances the energy input. Other forms for heat flow between the two levels are expected to compensate for the reduction in radiative energy transfer (despite greater temperature differences) if the planetary energy input and heat loss are to balance. One such candidate is convection, carrying both latent and sensible heat and where the energy transfer takes place in form of heat-carrying vertical motion. Indeed, warming below and cooling aloft give rise to more unstable conditions that favours convection. Convection is a common factor for many types of clouds, which need moist air to form. Usually the moisture is transported aloft through convection (photo:Rasmus). Higher temperatures near the surface also cause increased evaporation according to a physical law known as ‘the Clapeyron-Clausius equation‘. Evaporation requires energy so that heat, which otherwise would go to increase temperatures, is instead used to transform water to water vapour (phase change). Differences in the molecular weights of N2 and H2O means that moist air is lighter than dry air. Thus, increased evaporation favours convection, which transports both energy – as sensible (higher temperature) and latent (vapour) heat – and moisture. This is seen occurring naturally, especially in association with warm ocean surface in connection with the El Nino Southern Oscillation. Convection can therefore compensate for reduced radiative transfer if its mean vertical extent reaches the height of the planetary heat loss. Convection also is one of the factors that determines the thickness of the tropopause (Wikipedia on Troposphere: “The word troposphere derives from the Greek: tropos for “turning” or “mixing,” reflecting the fact that turbulent mixing plays an important role in the troposphere’s structure and behavior.”). Moist convection results in cloud formation: water vapour condenses and form cloud drops. The condensation releases heat and hence increase the temperatures, which subsequently has an effect on the black body radiation. 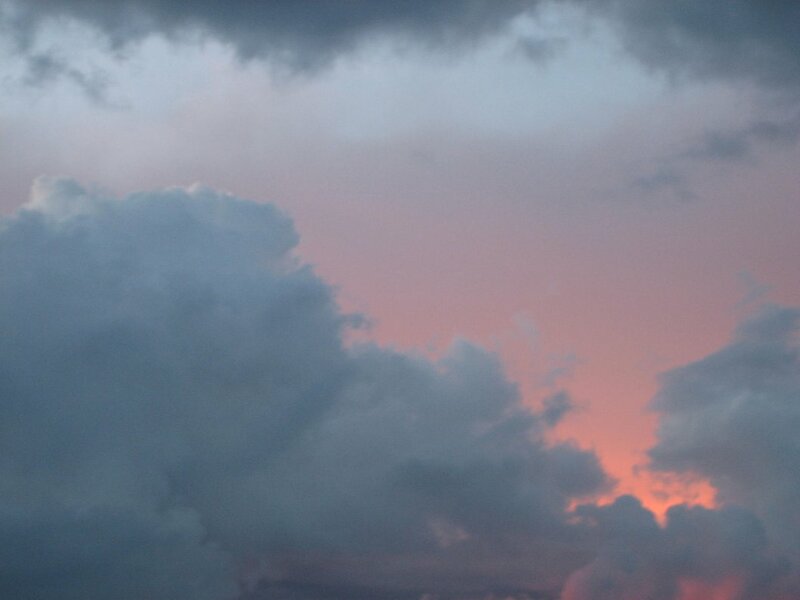 Hence, cloud formation plays a crucial role for the planetary heat loss – in addition to affecting the planetary albedo. The reason why Figure 9.1 in IPCC AR4 is disconcerting is that the temperature anomaly in the upper tropical atmosphere bears the signature of increased moist convective activity, which means that the hydrological cycle probably gets perturbed by increased GHG forcings, hence affecting rainfall patterns. There have been some misunderstanding regarding the enhanced warming in the upper troposphere – mistakenly taken as being inconsistent with the climate models, or taken as the “finger print” of GHE, rather than as a plausible consequence predicted for an enhanced GHE due to the perturbation of the hydrological cycle (the “finger print”-misconception assumes that the models are perfect). Changes in the convective activity also have other repercussions. Air just doesn’t pile up, but if is rises in some places, it means that there is sinking air elsewhere. A typical example of this is the Hadley cell, where the circulation involves rising air near equator associated with low sea level pressure and downward motion poleward of this region – an arid region known as the subtropics with high sea level pressure. A change in convection on a planetary scale, due to compensating a reduction in the vertical radiative energy transport, hence may have a bearing on drought and flooding events – and this is what the global climate models seem to suggest. If a shift in the hydrological cycle were to lower the response in the global mean temperature, there may be a poisonous sting in such a negative feedback: changes in the precipitation patterns. When GHG concentrations change, there is also a disruption in the vertical energy flow so that the planetary energy balance is perturbed. This is the frequently cited extra forcing estimated at the top of the atmosphere (TOA), and this is where some of the assumptions made above don’t quite hold (the picture is correct for a planet in equilibrium, but during a transition the planet is no longer in an equilibrium) and extra energy is taken up by warming of the oceans and surface. As a physicist, the key to understanding the relationship between GHE and the hydrological cycle – and indeed the troposphere – is in embedded in the question of what happens with the energy flow between the two levels where the planet receives its energy and where it leaves the planet. For more numbers and details, I’d recommend a number of posts previously published here on RC (here, here, here, here, and here). Is it possible for the physycist to explain Ferenc Miskolczi’s theories and disprove them in a peer reviewed journal? It’s resting, probably on account of it being so shagged out after its long journey and pining for the sun. One thought — the figure above works for me and is of a kind often used, but it took me a while to figure out because it’s a graphical presentation of data, not a picture. I think it’s a kind used often that’s very hard for nonexperts to interpret. To the naive viewer it looks like a picture or map, not like a graph. It would be great if someone could do an actual map showing how these different (isobars? layers of constant temperature?) lie in the actual atmosphere, a slice from pole to pole — mapping it to pictures that show the shape of the Earth and atmosphere would help. It’d make a great movie. I know this is a lot of work and not useful for the scientists. Could you add some comments with respect to the ‘conflict’ between the approximately -0.5 ºC ‘measured’ radio sonde temperatures for the tropical upper troposphere and those of the ‘red’ upper troposphere of the models – other than the fact that those ‘measurements’ are rather sparse? Rasmus – I’m fascinated by the large-scale convective issues that you touch on here. Could you or one of the other RC folks comment on a question I’ve been idly wondering about on this for a while now? The structure of Earth’s large-scale atmospheric circulation seems pretty stable – the 6 large-scale cells (Hadley, mid-latitude, polar on north and south sides), the Walker circulation over the large ocean basins, etc. This sort of organized convective motion is a common feature of this sort of fluid system with heat flowing against gravity – the Rayleigh-Benard cell in particular. But typically the structure of the flow itself changes as the temperature gradient and other physical aspects vary. So the question to me is: are there reasons for concern that Earth’s large-scale atmospheric circulation could be disrupted by climate change into an entirely new regime, with completely different circulation patterns? Is this something climate models have seen at all? What I’d like to see, though, is a fuller caption which explains what the various panels represent. Given that we are told that panel f represents total forcings, I’m guessing that the others must be specific forcings; probably c is GHE, and I speculate that maybe d is ozone. But it would be nice to know without going off to look up the original caption. Or a little more seriously, is “enhanced warming in the upper troposphere” not something we can rely on? First, I agree with Hank that the graphs are confusing. Second, a study just out says that the rate of CO2 increase seems to have plateaued in ’09. Can this be directly attributed to the economic downturn? Is it the result of some new dynamic in the troposphere? Or are such year-to-year fluctuations to random to connect to any particular cause? Finally, as Arctic sea ice coverage drops below 4 million k^ 2, what affect will a nearly or totally ice-free Arctic Ocean have on troposphere dynamics? The grey literature seems to have segued from WWF reports to late night TV magnetic bracelet ads. I think the expansion of the tropics should get a mention here. I’ve always found it amusing how denialists love to raise the upper tropospheric warming issue Len references in #4, but find the warming-induced movement of pretty much the whole atmosphere to be uninteresting. Without this explanation, I was unable to decode it at all. It might have been clearer if only panel f was shown. 1) Polewards expansion of both the subtropical dry zones and the jet stream. Could that have played a role in the intensity of the Great Russian Heat Wave of 2010? Seems likely, and it also seems likely that this “once every 500 years event” will become a one-every-five years event under warming scenarios – just like the record flooding events seen recently. CNN did fire their entire science team for covering starving polar bears in Alaska, so it’s no wonder that they’re trying to spin down any link to global warming, along with numerous other press outlets. Instead, they’re going to do another “in-depth” ClimateGate special. There’s been a 60% reduction in aerosol optical depth across Europe since 1986, and that appears to have lead to an increase in surface short-wave solar radiation (not due to changes in solar output!). That’s been a prediction of climate scientists for some time, that reducing aerosols would lead to warmer surface temperatures due to a reduced screening effect. Total absorbed radiation (TAR), the sum of SNR[shortwave net radiation] and LDR [longwave downward radiation], represents the total radiative energy available to maintain the Earth’s surface temperature and to sustain the turbulent (sensible and latent) heat fluxes in the atmosphere. The observed increase of TAR is the sum of the increase of SNR and LDR, and this radiation increase forced the observed temperature rise and increased the water vapour in the atmosphere. LUR [longwave upward radiation] is negative in the radiation budget and is calculated using the Stefan-Boltzmann law and monthly mean temperature values measured at the individual radiation stations. Total net radiation (TNR) finally is the sum of the surface absorbed and the surface emitted radiation fluxes, TAR plus LUR. TNR is positive and in the physical sense represents the excess of radiation energy that has not been used to heat the Earth’s surface, and instead is available for ground fluxes (usually very small) and primarily to sustain the sensible and latent heat fluxes, thereby closing the surface energy budget. Almost three quarters of the energy of all radiative forcings was used to increase the turbulent fluxes and hence water vapour in the atmosphere. decline and related solar brightening that strongly reinforced anthropogenic greenhouse forcing. It’s something like moderately good news, in that the aerosol reduction & solar brightening are temporary in nature, and once adjusted to the new conditions, temperatures will continue to rise in Europe at a more modest rate of +0.2C per decade, similar to the global warming trend. Rasmus, good article. A lot of people have been trying to explain the ‘tropical hot spot’ physically while at the same time dispelling the myth that it’s a ‘unique signature of CO2.’ See e.g., Skeptical Science, Skeptical Science (again), number 3, Deltoid, and myself. is a bit off-target and incomplete. In fact, in most (all?) GCM’s evaporation (and precipitation) goes up much less rapidly than Clausius-Clapeyron, while the water vapor mixing ratio scales evenly with the saturation vapor pressure. This is seen observationally and in models as a weakening of the zonal circulation (Walker) in the tropics, and to a lesser extent, in the meridional (Hadley) since the rate of exchange of water parcels between the boundary layer and free atmosphere goes down. This puts a different perspective on the commonly-cited notion that the ‘hydrologic cycle becomes more intense’ depending on what that actually means). Still further, it is conceivable that a colder climate could increase evaporation if wind speeds were to increase substantially, or this could also happen if boundary layer relative humidity were to decrease. Even further, evaporation is in effect limited by the solar heating (or it can somewhat exceed the solar heating term if there’s a inversion at the surface, with sensible heating providing the missing energy), so that at some point increasing CO2 can make the atmosphere warmer but not increase precipitation. The precipitation question is examined from either conserving energy in the troposphere (i.e. looking at the condensational heating term, with latent heating being balanced by radiative cooling) or at the surface (i.e. looking at the latent heating associated with evaporation). The TOA/tropopause forcing arguments used for global temperature hold little value for the hydrologic cycle. The tropospheric energy budget, for example, is why precipitation spreads in model projections are much smaller than the temperature spreads associated with unknown climate sensitivity, as the trop. energy budget is much less dependent on the shortwave scattering component which makes up the bulk of uncertainty with cloud feedback. Actually one amusing animation that tries to interpret the greenhouse effect in a visual manor is the PHET greenhouse effect simulator. It makes the photons look like falling snow! I have set up a simple (it avoids convection and other issues) greenhouse effect simulator myself which was created in Flash, it’s a work in progress and I hope I haven’t made any serious blunders with the science!??! I think there is potential for this sort of educational tool. “a 60% reduction in aerosols” per the linked paper. Reduction in aerosols equals increased optical depth. You don’t need to mention ‘optical depth’ at all. Philipona et al. refers to a 60% reduction in aerosols. “AOD is a measure of atmospheric extinction through a vertical column of atmosphere as sensed by the satellite’s visible sensor. The higher the AOD value, the more aerosols are within a column; this translates to lower visibility within that column. AOD values < 0.2 represent low aerosol amounts (high visibility)." (Is that what Philipona et al. measured? The abstract refers only to a drop in aerosols but not to how they get the number). I don’t get that from Figure 9.1. The appropriate moist adiabat for convective neutrality in the tropics (whatever it is) also exhibits amplified warming in the upper troposphere. Couldn’t 9.1 be interpreted to mean that the modeled tropical convection is simply driving the atmosphere to a different, warmer moist adiabat? The key indicators for the hydrological cycle would seem to be changes in the rate of tropical atmosphere longwave cooling and changes in the tropical convective available potential energy (CAPE). More cooling would require more convection to maintain a given lapse rate; less CAPE would imply that more convection is having a bigger impact on the tropical temperature profile. > a study just out says that the rate of CO2 increase seems to have plateaued in ‘09. Doesn’t look like it. And here. The original article is here: it says that worldwide emissions went down in 2009 — a slightly different thing. I suspect it might be a bookkeeping artefact. No, the optical depth due to scattering increases with more aerosols and decreases with fewer aerosols. tau = k rho ds where k is the scattering coefficient, rho the density of the particles and ds the path length. (shown on left scale) and from 0 km to 30 km (shown on right). See Appendix 9.C for additional information. Based on Santer et al. (2003a). Note that solar and volcanic forcing warm troposphere and stratosphere, while greenhouse gas forcing warms the troposphere but cools the stratosphere. In the composite effect (f), the greenhouse gas forcing dominates due to its predominance in observed climate change over the past century. Regarding the hydrologic cycle, multiple factors operate, including important changes in atmospheric circulation patterns, as Chris Colose mentioned. In addition, there is probably a timing factor that affects the relationship between excess evaporation and excess precipitation. This will be subtle with a gradually increasing greenhouse forcing, but in a thought experiment, we might be able to see it at greater intensity. If we were to suddently introduce a large excess of CO2 into the atmosphere and then wait, what would happen? I would suggest the following. The atmosphere, because of increased infrared absorption and consequent delayed emission of radiation to space, would warm quickly according to the standard radiative transfer principles. As a result, it would become “drier” (i.e., relative humidity would decline) as well as warmer. Gradually, the warming effect would also affect the surface, but more slowly, particularly because of the inertia due to oceanic heat capacity. As the surface began warming into a drier atmosphere, evaporation would slowly increase, and drought-prone areas would become even more arid. Rainfall in the drier atmosphere would not increase in parallel fashion. However, with continued warming and eventual equilibrium, evaporation, at a now substantially increased rate, would be balanced by precipitation. The latter would also exceed the original rate, and as a consequence, regions vulnerable to excessive precipitation would see themselves even more drenched. Current observations are, I believe, consistent with these principles, in that as the climate has warmed, atmospheric water has increased, but continues to play “catch up” in that relative humidity has tended to decline slightly. Thanks for the distinction, MV. If emissions did go down in 09 but we are having the hottest year on record so far, with record temps being set around the world, what will a return to increased emissions bring? Re my above comment (#23) – I should have stated that volcanic forcing predominantly warms the stratosphere, and has little effect – mainly a slight cooling – on the troposphere due to its ability to reduce the intensity of solar radiation reaching the troposphere and the surface. Worldwide emissions went down in 2009 — a slightly different thing. I also suspect that it might be a bookkeeping artefact. One more comment on Figure 9.1 Deniers have often called attention to a comparison of solar warming (a) with greenhouse gas warming (c), claiming that the “tropospheric hot spot” is a fingerprint specifically of the greenhouse forcing, since (according to them) “the models clearly point that out”. What they fail to recognize is that solar forcing has been such a weak component of the total during the last century that the energy depicted in the solar diagram is very small on a relative basis. As a consequence, the entire tropospheric temperature change attributable to solar would be between 0 and 0.4 C, which is compatible with a very significant amplification of surface temperature in the upper troposphere (e.g., even a small warming there could be many times an even smaller warming at the surface). “The higher the AOD [aerosol optical depth] value, the more aerosols are within a column; this translates to lower visibility within that column. AOD values < 0.2 represent low aerosol amounts (high visibility). Over the Middle East, and especially over the Arabian Gulf, AOD values greater than 1.0 often occur and usually indicate dust, smoke or blowing sand events with greatly diminished visibility." review paper for an example. the atmosphere and the horizontal structure of the boundary layer. review paper for further discussion. I like the look of that. Very nice visual design! I wonder if you could borrow the physics system from the Colorado sim? Not to take away all your fun, but you could adapt the engine from that w/switches etc. made more pleasing to the eye, variable complexity visible, etc. My error, and apology to Ike. I had ‘optical depth’ backwards til a few seconds after I hit ‘enter’. Thank you rasmus. I need to read entries like this when able. I see no reason to doubt the correctness. i agree that the greenhouse effect and the “enhanced” greenhouse effect, otherwise known as global warming, is such a wonderful collection of physics that it would be best animated, by many, in many different ways. b. how the distribution of gases and water vapour, and pressures, humidities and temperatures change at various heights in the atmosphere, and at different latitudes. the equator is special, not just because we put a line on the globe, but because the forces on the air masses change 180 degrees there. the el nino circulation is so clearly right on the equator…and discussion of air mass cells and oscillations and cyclones, and monsoons and jet streams – all this really needs to be animated to make sense. static two dimensional pictures just won’t do. c. where energy accumulates and disperses – different forms of energy. people often confuse “infrared radiation” with “heat” in their minds, but it’s critical to separate the two concepts and show how each travels. showing how EM radiation, heat and air/water kinetic energy (in cells, circulations, currents, weather systems and convection columns and so on) move and how long they have to move before they reach some kind of equilibrium would go some way to visualising why it takes time for the earth system to respond to radiative forcing (commitment time lag). the changes in the levels and composition of the various layers of the atmosphere would be useful to show as well. The objective being to not end up in an verification deadlock a la nuclear weapons test bans. Possibly a promising tertiary delay tactic for parties interested in foot-dragging over C02 emissions. A movie we’ve seen before. 26 Worldwide emissions largely affect the rate of increase in CO2 concentration, not the absolute concentration. It is the concentration that controls the size of the anthropogenic forcing, not the rate of emissions. Denialists try to conflate these in order to misinform the unwary. I don’t like the H2O is lighter than N2 explanation for the greater propensity towards convection of moist air. The primary contribution, is that moist air, once it has cooled to the dew point has a lower lapse rate than dry air. The lower lapse rate is accounted for by the change in latent energy as moisture condense to droplets or evaporates. (1) I agree with Tapio Schneider (# 29) that the change in evaporation with global warming does not follow C-C relation. Thus, increased evaporation favours convection, which transports both energy – as sensible (higher temperature) and latent (vapour) heat – and moisture. People might imagine that the sensible heat flux increases with warmer climate based on your statement. It is not the case, however. The sensible heat flux decreases under a warmer climate, while the evaporation increase. Over global ocean, it is found the fractional decrease of the Bowen ratio follows C-C relation (1). (1) Lu, Jianhua, Ming Cai, 2009: Stabilization of the Atmospheric Boundary Layer and the Muted Global Hydrological Cycle Response to Global Warming. J. Hydrometeor, 10, 347-352. … The actual rate of mass flow would change with the change in convection but would also depend on how much heat can be transported for the same mass transport. A greater fraction of convective flux being in the form of latent heat would mean the same amount of motion with the same temperature distribution would tend to accomplish a greater convective heat flux. How would the temperature distribution affect this? The motion tends to pull the temperature profile towards a (temperature-dependent) moist adiabat (except below the cloud base of course; there it would be a dry adiabat) (horizontally larger-scale overturning driven and organized in part by differential horizontal heating can maintain a smaller lapse rate). But if it were precisely at this adiabat (and horizontally isothermal), then localized overturning would accomplish no net sensible heat transfer; it is the difference in temperature (at some pressure level) between upward and downward moving air that results in some vertical net sensible heat flux. So greater sensible heat flux (for the same amount of motion) would occur if the air becomes more unstable to convection in between periods of convection, or if the horizontal temperature gradient becomes larger… but that would occur if the amount of overturning is itself reduced or limited to … well, you get the idea (and if the thermally-direct overturning were reduced, the net differential radiative heating/cooling available to drive such motion would itself decrease because of the resulting temperature changes). Regarding the zonal average cross section graphs of temperature changes – I’ve wondered what these would look like seasonally. Regarding a weakenning of the Hadley cells – is this specifically refering to the streamfunction between the center and edge of the cells? (with the same streamfunction, vertical velocities would be reduced by horizontal stretching and horizontal velocities would be reduced by vertical stretching). What does this look like seasonally? And with widenning of the Hadley cell extent, would the seasonal migration of the ITCZ also increase (and is that related to any changes in variability)? Would the ITCZ width at any one time (and longitude) (including just enough of a range of time and longitude to be able to define the ITCZ) tend to be the same fraction of the width of the whole cell (I’d guess it doesn’t)? Thanks for taking some time to have a look at the project and the positive feedback. I want to keep the project relatively simple so that it gets a few basic concepts over and then encourages people to investigate further. re: the visual design- I have a masters degree in electronic media design, a career in software development and a background in engineering. So I’m not to bad at graphics and coding. Good idea but I have a point or two to add. I’m sure you know all this Jo but some readers might not pick it up from your comment. I did not see much explicit reference to the warming of the troposphere which will need a discussion of the collisions between the CO2 and O2 or N2. almost always in a different “colour”. Does CO2 also have a cooling effect? When a mixture of CO2 and other non GHGs is heated by any other source of energy but infrared, by the fact that CO2 transforms part of this energy in infrared radiation means that the respective mixture will cool faster then same mixture without CO2. Is this true? Where can I find more about this subject? To mircea (#42). Yes, CO2 can cool. CO2 emits radiation (a cooling effect) as a function of temperature and the emissivity of CO2, according to the Stefan-Boltzmann relationship, but absorbs radiation (a warming effect) as a function of exposure to infrared radiation. If heat in a mixture comes from a source in wavelengths not absorbable by CO2, CO2 will not contribute additional warmth, but will cool via emission of infrared radiation. To some extent, this occurs in the stratosphere, where much of the warmth is the result of the absorption of solar radiation by ozone (mainly UV). CO2 does not absorb UV, but at stratospheric temperatures, emission of radiation is primarily in the IR wavelengths, where CO2 is a good emitter. This contributes to stratospheric cooling resulting from increases in atmospheric CO2. How about a preview function instead of a spam filter? since the electromagnetic radiation absorbed and re-emitted by carbon dioxide are in fairly closely defined ranges, i think it’s fair to use the word “colour”. as for carbon dioxide and nitrogen gas and oxygen gas and the collisions you mention – the concentration by volume of carbon dioxide in the atmosphere is very small – the most significant effects in the bottom layer of the atmosphere (troposphere) will surely be the heat trapping effect of increased carbon dioxide combined with the pressure-height changes of concentrations of carbon dioxide due to the warming effect. the collision rates between CO2, N2 and O2 at any one particular height would be somewhat increased by the warming, but somewhat decreased by the expansion of the gas collection due to warming, surely ? as far as i understand it, the concentration, accumulation and depletion of carbon dioxide (and the other greenhouse gases) at different levels of the atmosphere is the key, as this determines the height at which net emissions of electromagnetic radiation to space occur, and the temperature gradients (rising in the troposphere and falling in the stratosphere over time). remind me if i’ve forgotten something or not understood your point. Think about evolution etc. jo abbess. The visible range shoots down through the atmosphere and hits objects, bouncing off them. If life evolves to utilise the visible range, it can determine where objects are spacially, like radar is used to detect objects by bouncing electromagnetic radiation off them. Visible light can also give other information as you have said. However in the infra-red range you can’t obtain as much info about an object because there isn’t much coming directly from the Sun through the atmosphere. IR is a secondary source of info so would be less useful. In the evolutionary process, creatures using the visible range would be at a distinct advantage hence over a very long time, you end up with a lot of species that use the visible range for ‘seeing’. The processes are just chance and elimination, survival of the fittest. Species that live in other environments, eg caves evolve differently. > why do we detect the colours blue and violet ? what do we need that for ? Ask any photographer who’s done daytime or moonlight photography. If you’re insensitive to blue, shadows are pitch black, as they’re only illuminated by blue skylight, and the moon is invisible, since its light is blue (the color of the daytime sky, once its light comes through the atmosphere). And moonlight turns out to be useful for all sorts of things, including timing. Thanks for the context. Interesting detail : some creatures see more infrared or ultraviolet than we can – also part of the sunlight. Aha ! Thank you. Excellent insight. We are truly 24 hour creatures. Another aside – have you ever looked into this : that by careful observation of the Moon through its phases, and through logical reasoning, it is entirely possible to figure out the configuration of the Solar System without the aid of sextant or plumbline ? By the way, nobody has picked me up on the use of the phrase “the heat trapping effect of increased carbon dioxide”. Of course, Carbon Dioxide doesn’t trap heat – it actually “traps” infrared radiation by back-radiating it to the earth. The infrared radiation hangs around longer than it would have done, some being absorbed by matter, causing heating, which causes higher re-emission (the blackbody spectrum of the whole Earth’s emissions moves slightly to a higher energy-temperature profile, in order to balance out the radiation budget of the Earth). b. The differential in the atmospheric layer heights between tropical and mid-latitude (North Hemispheric) regions ? c. Parallel analysis of similar heating profiles in different heights of the troposphere. d. Parallel analysis of heating in the troposphere and cooling in the stratosphere. e. Evidence of changes in the height-temperature profiles in any layer of the atmosphere. I understand there are some disputes in this field, and I want to be able to differentiate proper Scientific discussion from sceptic-denier confabulation and dissembling and obfuscation. Since blue light gets scattered as sunlight comes through the atmosphere (making the sky appear blue), surely blue light from the moonlight also be scattered ? An interesting question.